Whether you're at work or at home, every day you face new challenges (small & big) and along with it comes—deadlines and the much-needed reminders. We often scribble important things either on paper or in a normal word processor or in a notepad type application. If you have a paperless office, your best bet is having a good sticky notes application for your PC. Here are some of the best sticky-notes apps to keep track of your goals. These applications are free-to-use and transform your desktop into a stick notes board where you can quickly jot down important information in an easy way. One can easily create new notes and can instantly delete the old ones which are no longer needed. One can also tweak and quickly customize the attributes associated with these sticky notes to match with their workflow and preferences. Almost all of these sticky-notes applications can be used on all popular variants of Windows without any issues. Do try out these handy sticky-notes applications and see how you can save your time and money. Some of the sticky-notes applications mentioned here work on Mac and Linux as well. Smartphones apps are also available for most of the options included here. I prefer minimal UI sticky notes and recommend the same for you. Let's get started and check out these handpicked sticky-notes applications. 1. 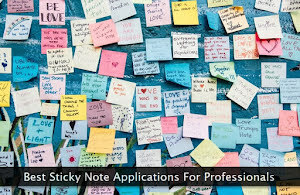 Hott notes - This excellent application support multiple types of sticky notes. If you're using a stylus with your tablet PC, you can scribble freehand text and drawings on your sticky note. Hott notes also let you set alarms for important notes. Another worth looking feature is the archiving capability that saves your sticky notes for future use. And, best of all—it's free! 2. Efficient Sticky Notes - What I like most in this application is the in-built recycle bin. If you accidentally delete your important sticky notes, you can easily restore them with a click of a button. It also supports powerful search capability to scan through all active sticky notes to quickly spot your important reminder. It's available for both iOS and Android platforms. 3. Stickies - I like its capability of storing images within the sticky notes. The interface is clean is soothing to eyes. Stickies also support transferring of notes from one PC to another through a regular email client. You can also hide your sticky notes for a definite period and they pop up back like magic when the time is over. Developers can also use its powerful API library. 4. Simple Sticky Notes - I personally use this sticky-notes application because it's minimal yet very powerful. Usual rich text support with hiding/un-hiding feature makes it one of the best sticky-notes applications available for an average user. It also has a dark mode as well as a Facebook sharing feature. I highly recommend using this free and powerful sticky notes software. 5. TK8 StickyNotes - This application has the best interface that will make you addicted to it in no time. It has a freeware as well as shareware version. The former version is good enough for an average user. You can also pin your sticky note to keep it above all windows. The pro versions support advanced features like password protected notes with reminders and email integration. 6. Cloud Sticky Notes - This yet another desktop sticky-notes application with cloud support. You can launch it both from a web browser as well from the desktop. One can use custom fonts along with transparency effects for the sticky notes. Whenever required, a user can create notes in offline mode and can later sync them with the cloud. Do once try these sticky notes. 7. PNotes - This one is an extremely feature-rich sticky-notes application. It's a portable application and can be launched from a USB stick too. Customized tables can be included in the sticky notes with rich text support. Instead of text, one can also use free-hand drawing within the notes. A rich collection of skins makes it one of the attractive sticky-notes options. 8. 7 Sticky Notes - It's a must-try sticky-notes application because it can help you to be more productive. You can not only send a sticky note to sleep for a specific time period but can also trigger a custom task whenever it wakes up. It also has the support for adding file and folder attachments to the sticky notes. Fancy UI effects make these sticky notes quite attractive and user-friendly. 9. Notezilla - This application has a cloud synchronization feature that enables you to access your sticky notes from anywhere. It works flawlessly on smartphones too. You can add reminders to the sticky notes to ensure nothing important is missed. It also allows you to attach your sticky notes to almost any object on Windows. Skins and custom textures can also be applied to the sticky notes. 10. StickyPad - This multilingual sticky-notes application is packed with features. Apart from using the notes on a desktop, you can also attach them with any application. These sticky notes can also be included in an email. Shortcut keys support ensure you can work with your sticky notes without using a mouse. Always-on-top and translucent effects are also supported. All the options mentioned above are primarily desktop-based applications. Following are some of the online sticky-notes applications you can directly use within a web browser. 1. Note.ly - This simple and easy-to-use sticky-notes application is good enough for your daily use. Custom notes background can be configured to match your preference. Both a regular note and a to-do list are supported. If required, one can also add images in the form of a sticky note. 2. Google Keep - And, if you're a fan of Google services, try this cloud-based sticky-notes application. You can save your notes directly to the Google Docs platform too. Custom labels enable you to segregate the notes as per your needs. Collaborators can also be assigned to the sticky notes. 3. Simplenote - As the name suggests, this sticky-notes application has a minimal interface and works like charm both on a desktop and on the smartphones. Version history support ensures that you can go back to the older versions of your sticky notes. It also has Markdown support. If you're not a fan of 3rd-party applications, there's an excellent native Windows 10 sticky-notes application. It's also available on older versions of Windows. You can easily open this application via the start menu. Its minimal interface enables you to quickly create sticky notes without any complexity. Various colors can be assigned to individual sticky notes. The notes can be styled easily through a footer menu bar. A to-do list can also be created with a click of a button. A blazing-fast search option enables you to find the desired sticky note—instantly. Both a dark and a light mode is also available for the sticky notes. Do once try it for your daily work routine reminders.